Win a Fat-Tad Electric Recumbent Trike! *with 36v10ah Li-ion battery, charger &amp; rear rack! 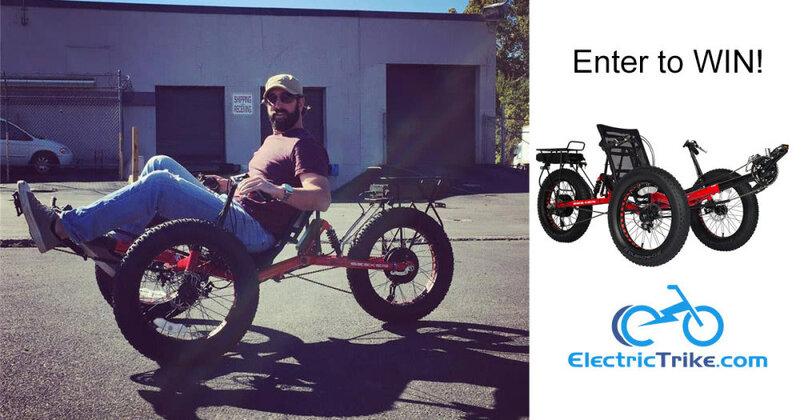 Win a Fat-Tad Electric Recumbent Trike! *with 36v10ah Li-ion battery, charger & rear rack! *Ships to Contiguous USA Only. 1. Eligibility: Sweepstakes (the "Sweepstakes") is open only to those who sign up at the online sweepstakes page and who are at least 18+ years old at the time of entry. The sweepstakes is open to the legal residents of the United States and is void where prohibited by law. Employees of Electric Bike Technologies LLC (the "Sponsor") their respective affiliates, subsidiaries, advertising and promotion agencies, suppliers and their immediate family members and/or those living in the same household of each are not eligible to participate in the Sweepstakes. The Sweepstakes is subject to all applicable federal, state and local laws and regulations. Void where prohibited. 3. Sweepstakes Period: Entries will be accepted online starting on or about August 1st, 2018 at 12:00 AM and ending January 31st, 2019 at 11:59 PM. All online entries must be received by January 31st, 2019 at 11:59 PM. All times are (GMT-05:00) Eastern Time (US & Canada). 5. Prizes: The approximate retail value of all prizes is $3248. The prizes are: electric Fat-Tad recumbent tricycle. You are not guaranteed to win a prize and your chance of winning is dependent on the total number of eligible entries received. Actual/appraised value may differ at time of prize award. The specifics of the prize shall be solely determined by the Sponsor. No cash or other prize substitution permitted except at Sponsor's discretion. The prize is nontransferable. Any and all prize related expenses, including without limitation any and all federal, state, and local taxes shall be the sole responsibility of the winner. No substitution of prize or transfer/assignment of prize to others or request for the cash equivalent by winners is permitted. Acceptance of prize constitutes permission for Electric Bike Technologies LLC to use winner's name, likeness, and entry for purposes of advertising and trade without further compensation, unless prohibited by law. 13. Winners List: For the names of the winners, please contact us at and in the body of the email type 'Please e-mail me the winners' list for the Electric Bike Technologies LLC Sweepstakes.